Having been back home in Colorado for just a month and with the scars of the auction loss healing Kirk gave The Gasbox workshop number a call. 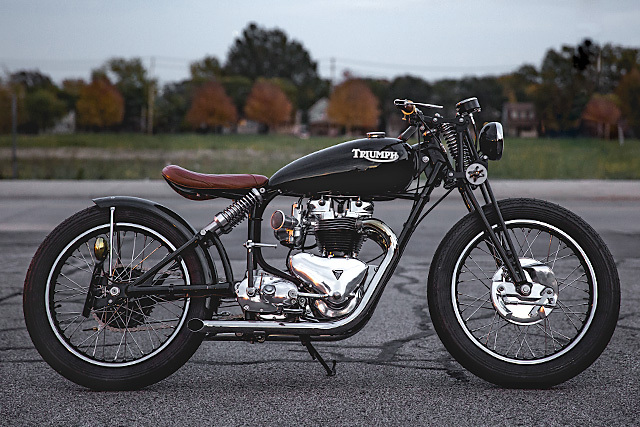 He knew what he was after and he wanted Jesse to work his magic and build it, a slick as slate classic Triumph. 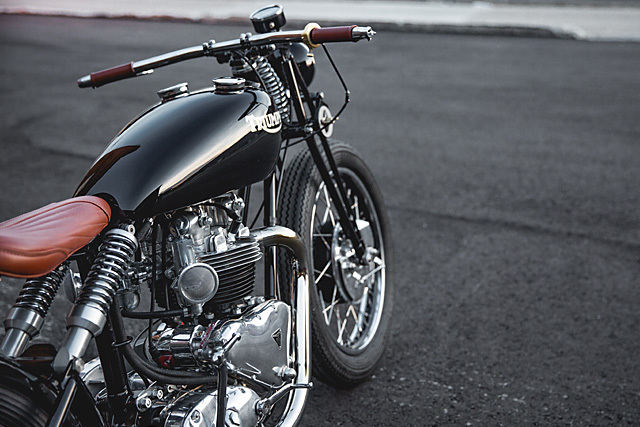 “The build started out like most, he wanted a rigid bike with lots of shine. 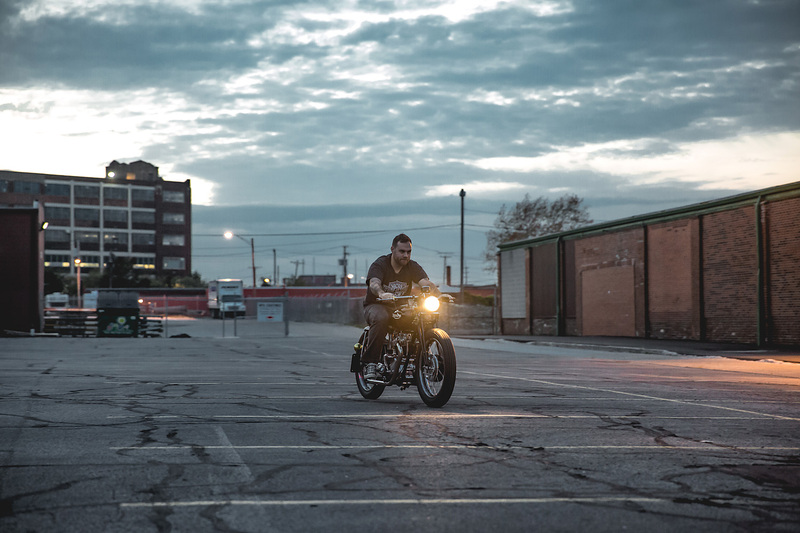 But after seeing how nice the rebuilt engine and transmission looked polished and assembled, He asked if we could make it look like a Vincent,” explains Jesse about the unorthodox design process. 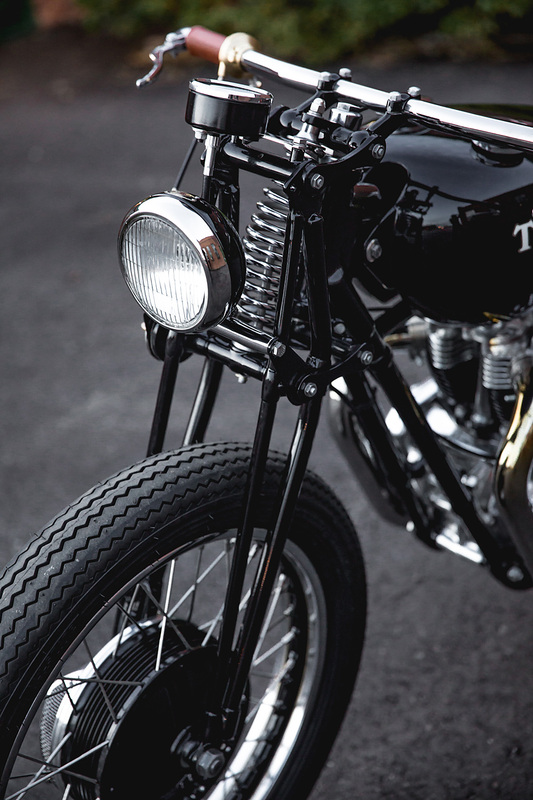 It all starts with the smooth lines of the original 1960 Triumph frame and swingarm. Both have been prepared to perfection, rid of any blemishes and coated in the classic black chassis paint of the time. 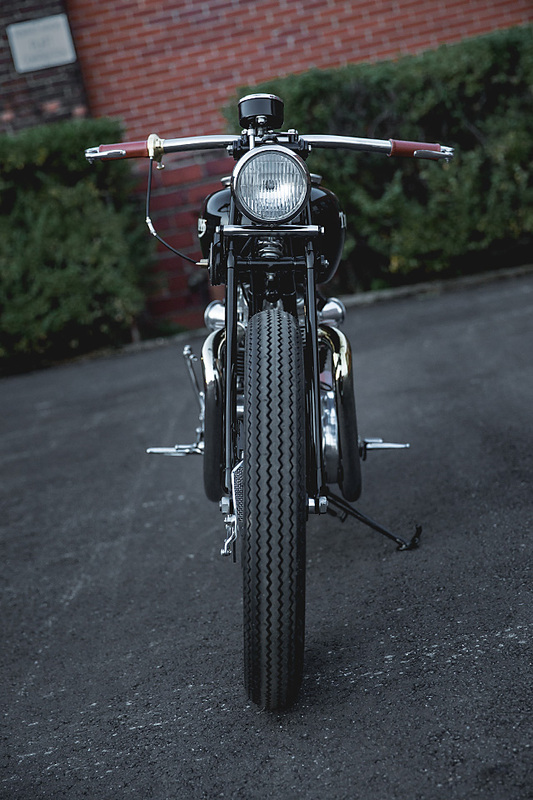 To get the period look and some Vincent character the Triumph’s telescopic forks were ditched for a BSA girder arrangement. 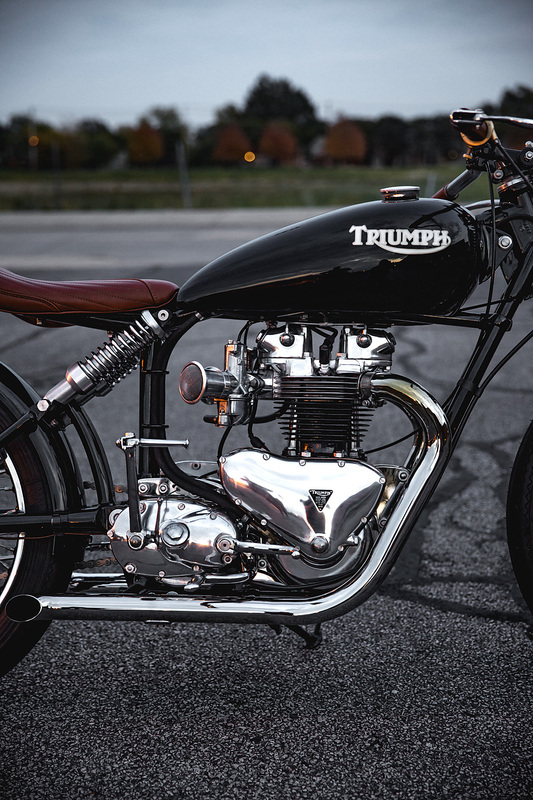 But it was the rear end that would prove the major work in the transformation of simple Triumph into vintage masterpiece. They knew the look they were after but there was simply no room for standard springs. Not wanting to stretch the swingarm or distort the dimensions a unique setup was conceived. 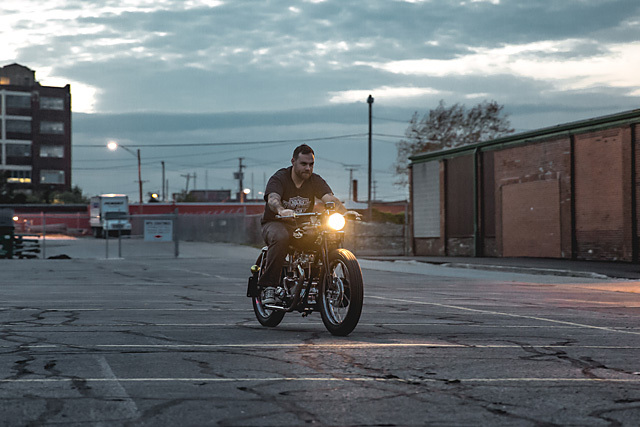 “I started by purchasing 2 Vincent shocks, these are just the shocks without and springs,” says Jesse. The result is a superior version of the original Vincent Black Shadow style setup that has attracted loyal fans for generations. 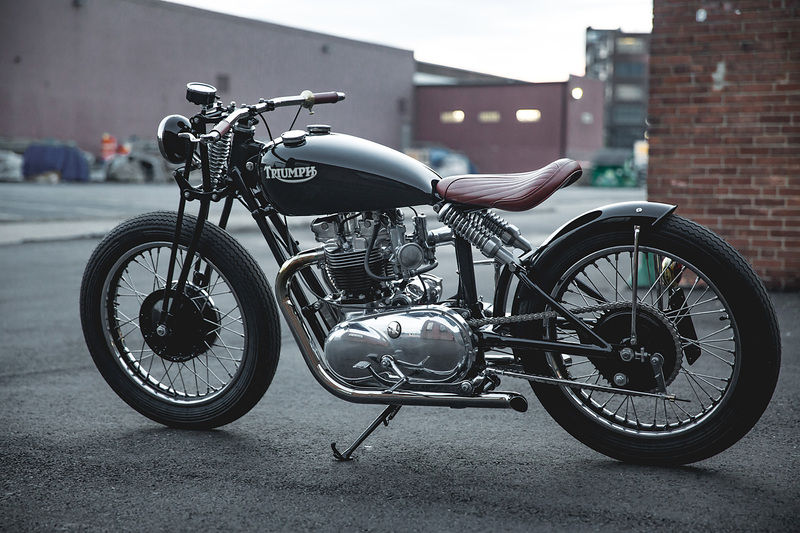 So it made perfect sense to compliment the rear with a Vincent styled fender that neatly hugs the tyres lines. Like everything from The Gasbox the fender’s struts may at first appear simple but their fabrication, fit and finish is absolute perfect. The fenderless front end gives a far cleaner look than many original vintage machines with their unsightly large guards. 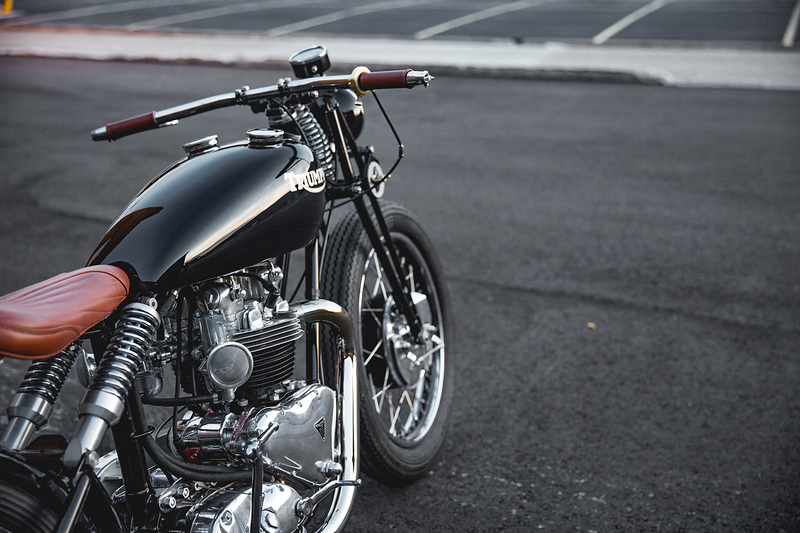 While the workings of the BSA girder have been painted, polished and chromed to ensure there is as much to catch the eye on the front as there is the rear. 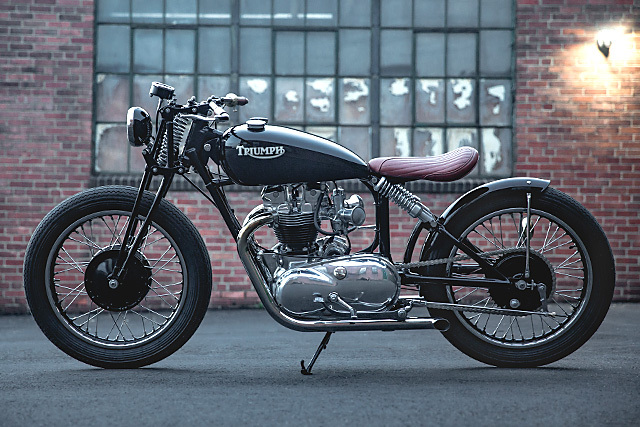 The gas tank might look like a totally stock item but Jesse has plenty of tricks up his sleeve. With the Vincent storing its oil in the frame the design called for no visual oil tank. Vincent’s also have a generous amount of sheet metal in their tanks and it was something Jesse and Kirk wanted to capture. “We wanted the look of a large fuel tank,” they remarked. So to get the best of both the tank was fabricated so that the left side stores the fuel and the right side the oil. 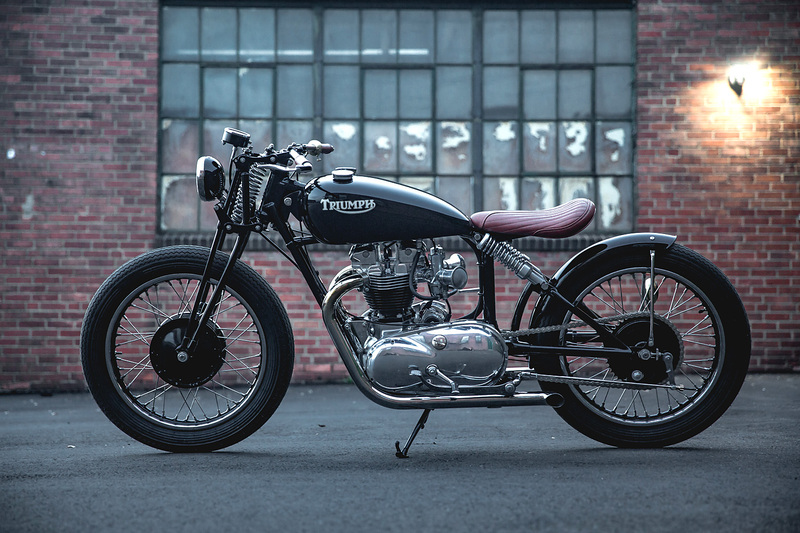 This is achieved while still maintaining the Triumph’s internal plumbing arrangement. With the flawless metal work finished it was time for paint and nothing says Vincent like black! The incredible depth to the classic hue cannot be overstated, it might be a solid colour but it reflects the light like a disco ball. 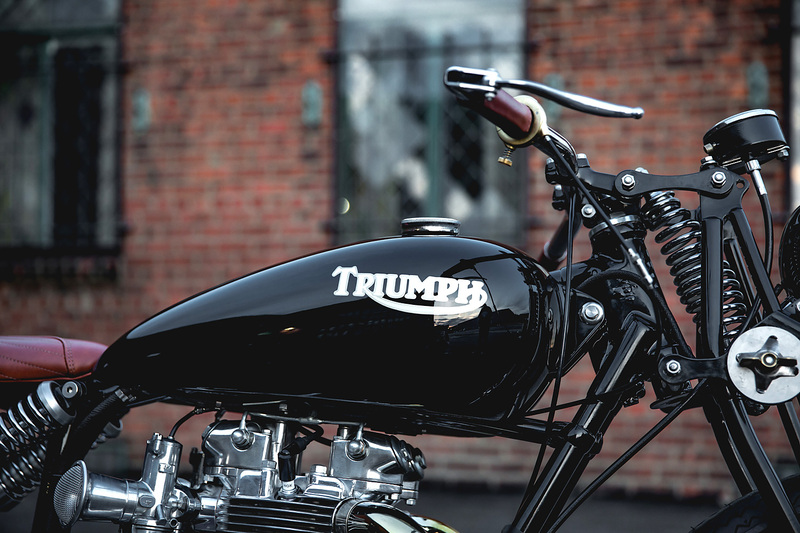 The Gasbox have never been ones for crazy paint or graphics but the Triumph logo by Aerografix gives the perfect look. It’s exactly what you used to see on the very best high-end, vintage, British hand-built machines. The rich black has been applied to every surface that doesn’t have a mirror shine with one notable exception. Rather than fit a long two-up Triumph seat the Vincent styling continues with a bobber styled piece that floats over the rear guard. 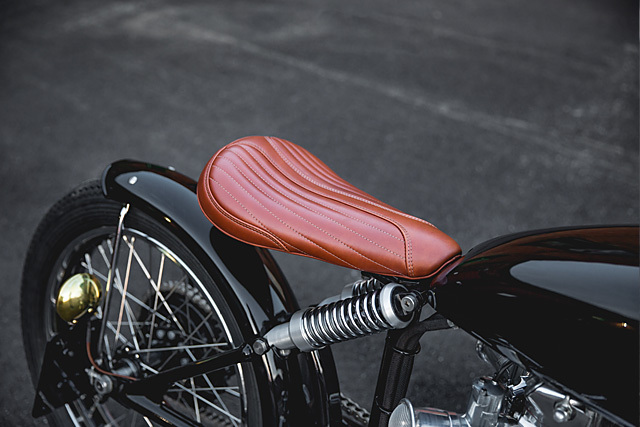 The brown leather work by Union Speed and Style is simply phenomenal and classic in design. There is more leather up front with Kirk insisting on vintage inverted bars, with matching hide grips. 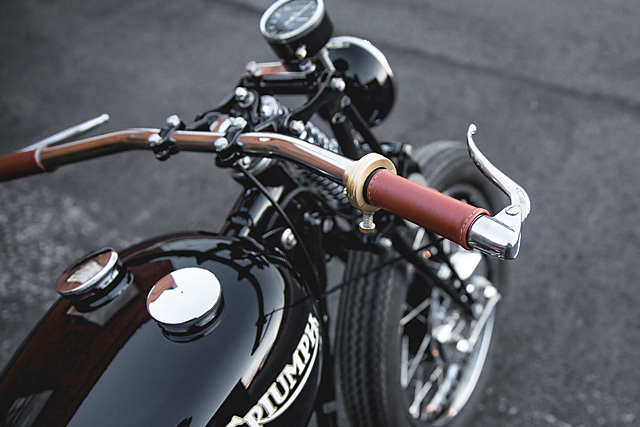 The flat bars in a chrome finish are just what the doctor ordered and the brass throttle assembly is the perfect touch. The minimalism continues with a vintage Smiths gauge cleverly mounted to the upper link of the girder. 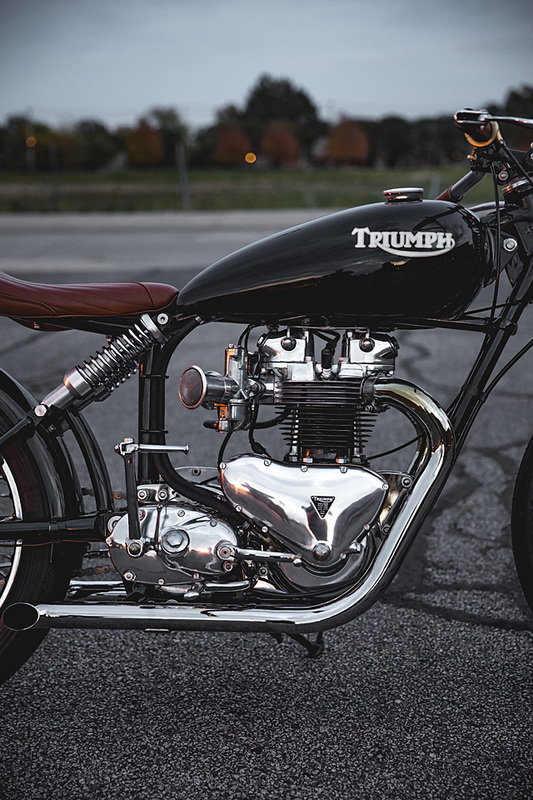 However engineering minimalism doesn’t get much better than a classic pre-unit vintage twin cylinder from the Brits. Modern engines with their compact integrated gearboxes, intelligent electronics and rare materials might make bulk power and run like silk. But they lack a certain je ne sais quoi’ that is the raw mechanical symphony of an old power plant. Both engine and gearbox have been completely rebuilt so Kirk can enjoy trouble-free Sunday rides. The twin Amal carbs look just as good and gulp their air through a set of polished and meshed velocity stacks. With the polished lump in the blacked out frame The Gasbox fabricated a stunning twin pipe exhaust system that looks as good as it sounds. Its ends vent the gases away from the rider’s feet which now sit lower thanks to a set of one-off pegs. The standard foot controls have been lowered and set further back for an improved riding position. 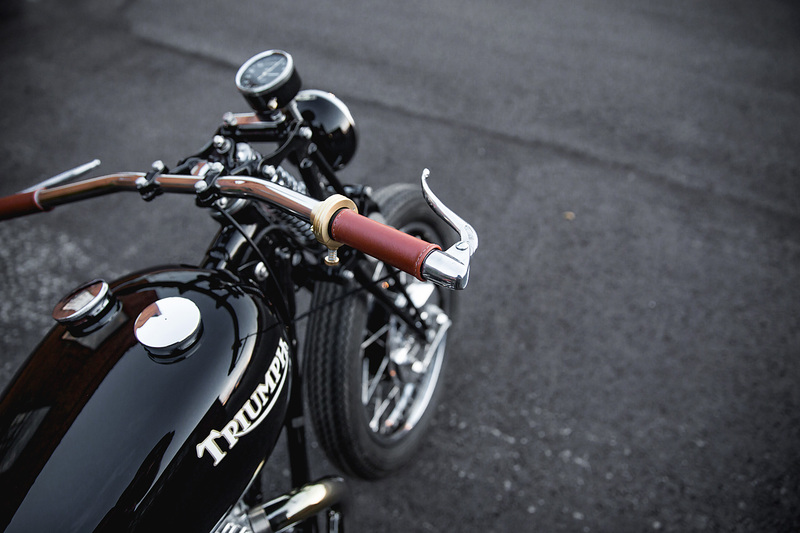 While being kick-start only and right foot shift means you ride the vintage way to match the styling. 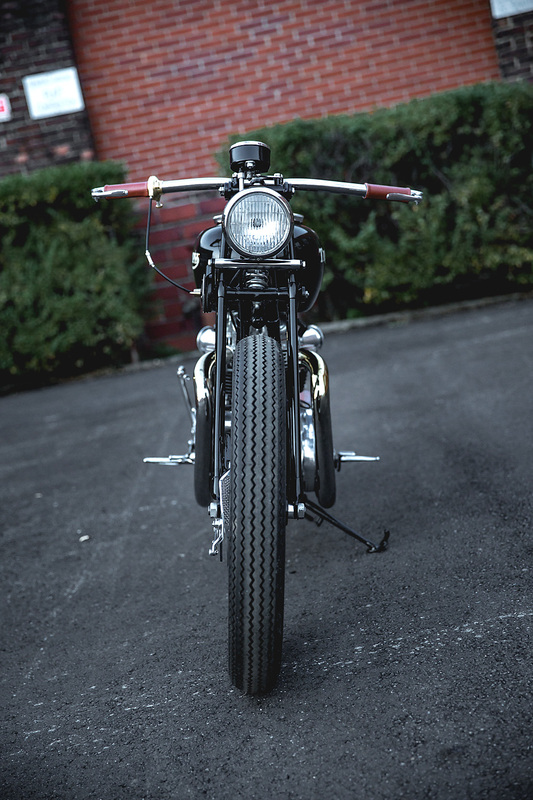 The lighting is classic front and rear, with the smaller diameter headlight reminiscent of the sporty Vincent look. But even the minor details Jesse goes out of his way to get just right; the wiring for the brass rear light is shielded in a copper tone to take on the appearance of an old fuel line. So it makes perfect sense that the rubber is straight from the vintage experts at Allstate Tires in the Safety Tread style. Both wrap around 19″ rims front and rear, a one inch increase at the back, for a perfectly flat stance. With a pair of chrome filler caps fitted up and the axle mounted license plate holder bolted on Jesse could kick the old girl to life. 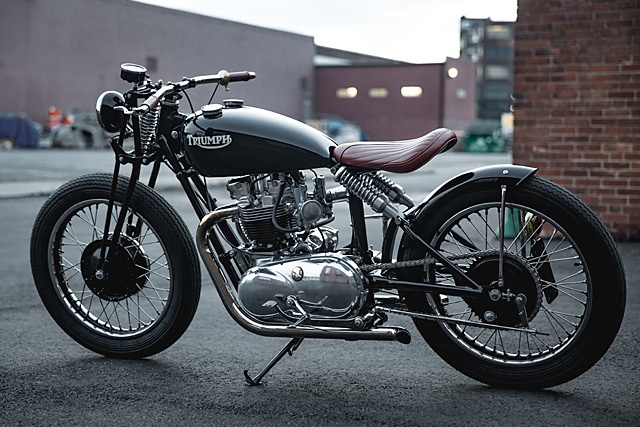 It’s literally the best of British with a Triumph base, Vincent theme and BSA Girder front end all melted seamlessly into one timeless package. 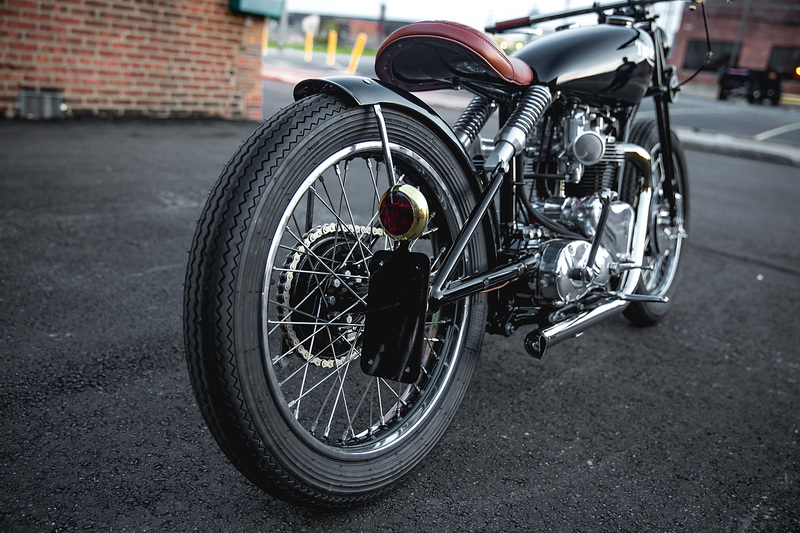 Kirk always wanted a classic bike built by the masters of old school cool at The Gasbox. 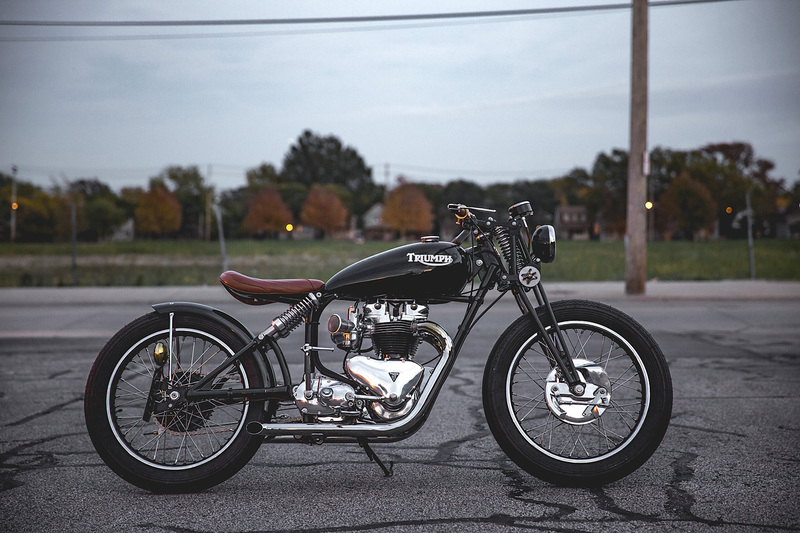 He may have missed out on the Indian at auction, but when the hammer dropped on the Triumph build its clear Jesse insured he still walked away a victor.